Dandruff is one of the most common hair problems faced by millions around the world. Sometimes, a fungal or bacterial overgrowth on your scalp is causing the flaking skin and excessive itching. Dry skin or medical conditions like eczema and psoriasis also lead to dandruff. Shampooing your hair too often, using styling products and not conditioning your hair regularly can also disrupt your scalp’s natural pH and make it conducive for microbes to thrive. If left untreated, it can also lead to severe hair loss. While specific shampoos and treatments are available in the market, they tend to dry out your hair and make it brittle with frequent use. The chemicals present in these products can also hamper your hair growth. If you wish to conquer dandruff healthily, it is time to turn to the panacea of health – apple cider vinegar. 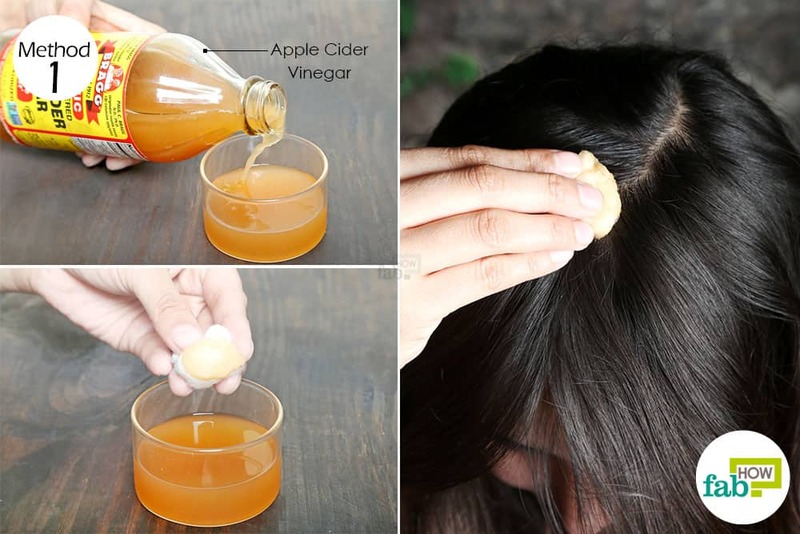 Apple cider vinegar, along with the “mother,” helps normalize the scalp’s pH and its antimicrobial enzymes kill any fungal or bacterial growth in no time. If the dandruff is due to a health condition, it can also help treat the underlying cause and control the symptom. Also, apple cider vinegar imparts a natural sheen to your hair and cleanses the hair follicles to boost hair growth. 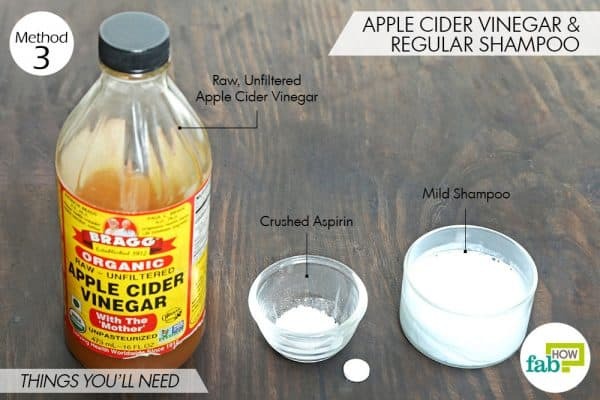 Follow one of the eight methods below to use apple cider vinegar for dandruff. 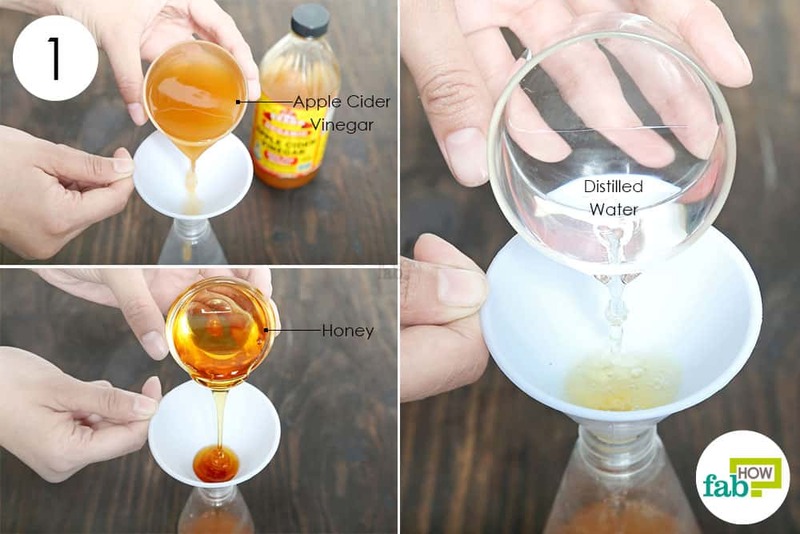 Be sure to use an unprocessed, unfiltered variety of apple cider vinegar. The cloudy particles found at the base of the bottle, called the “mother,” contain the essential enzymes. 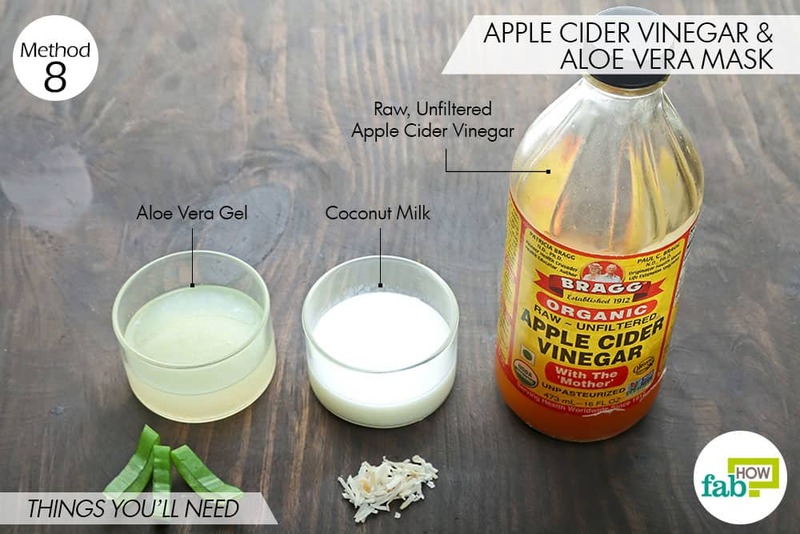 If your skin is not too sensitive, nothing will work better than applying apple cider vinegar directly on your scalp. 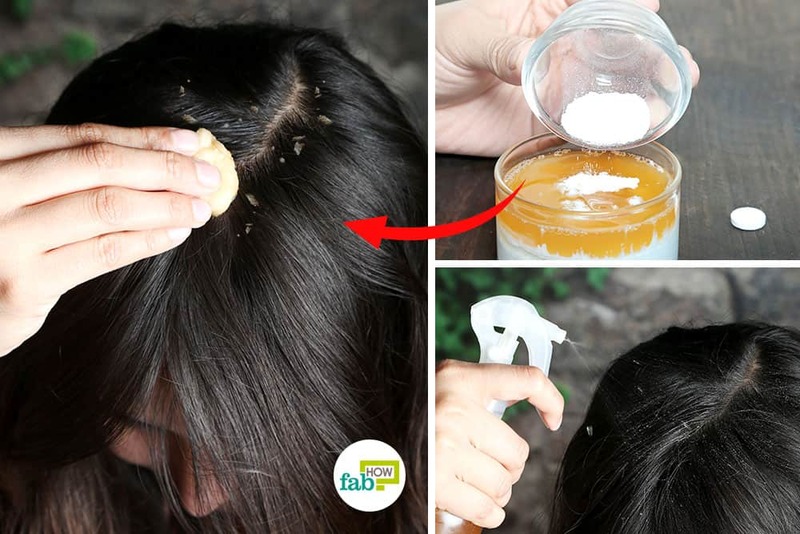 It will absorb into your skin and get rid of pesky dandruff in less than a month. Caution: Apple cider vinegar can be pretty strong in its undiluted form and can burn if your scalp is scratched or bruised. It’s best to do a patch test first on the inner side of your arm to check your skin’s sensitivity. Also, be careful applying the vinegar on your scalp. If it accidentally enters your eyes, it can burn a lot. If that happens, immediately rinse your eyes with cold water. Pour ½ cup of raw, unfiltered apple cider vinegar into a container. This quantity will be enough for medium-length hair. 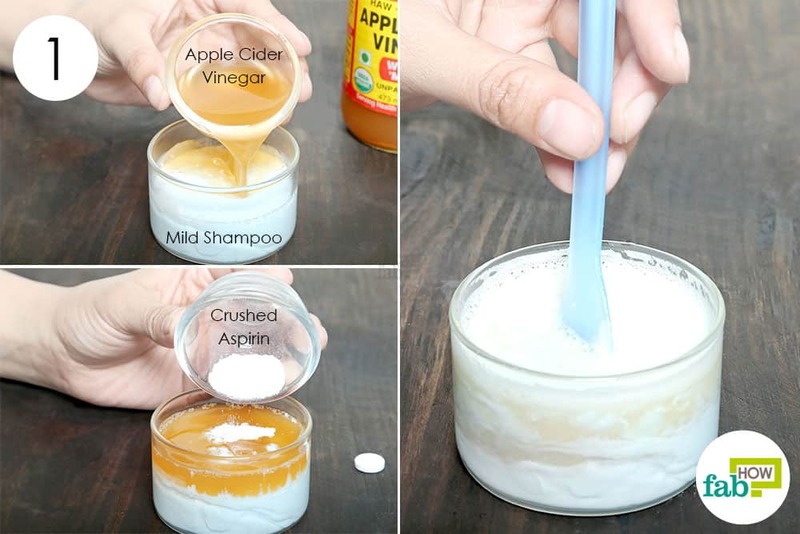 Partition your hair and use a cotton ball to dab the apple cider vinegar along the lines. Continue until you cover your entire scalp. Wrap your hair in a warm towel and wait 1 hour. Rinse your hair with warm water. Do not shampoo it. 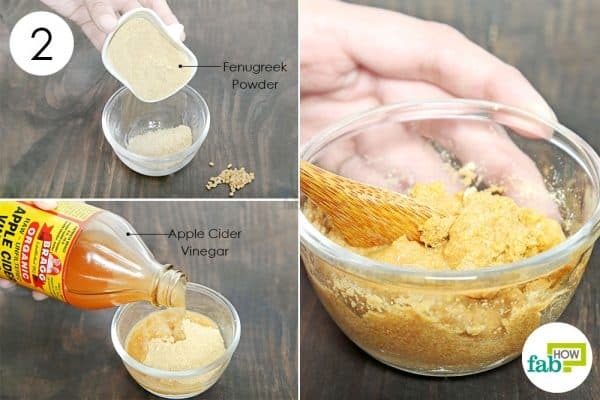 Do this twice every week for 1 month to use apple cider vinegar for dandruff. 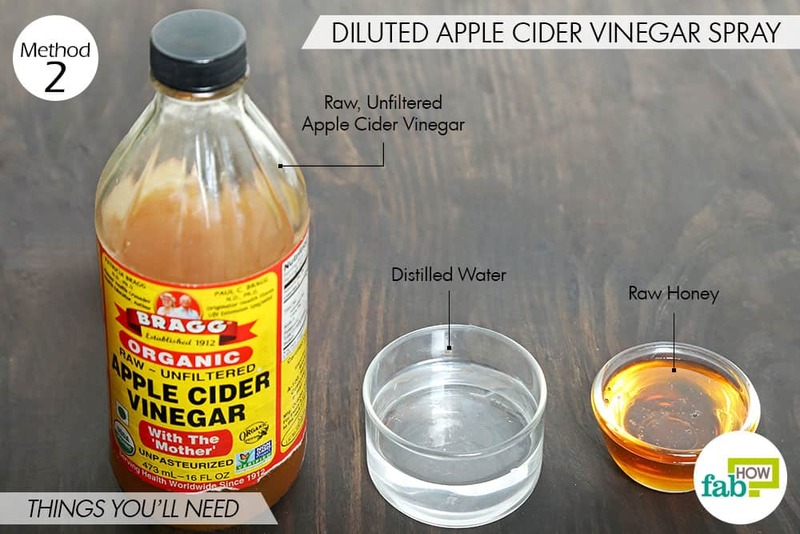 Using diluted apple cider vinegar is preferable, especially if you have sensitive skin or an inflamed scalp. To dilute it, you need some honey and distilled water. The honey compensates for the potency lost in diluting the vinegar. Like apple cider vinegar, honey is a powerful antimicrobial agent that can effectively treat dandruff. Plus, it works as a humectant that counters the drying nature of apple cider vinegar to keep your scalp moisturized. Funnel ⅓ cup of raw apple cider vinegar into a small spray bottle. Add 4 tablespoons of distilled water to dilute the vinegar. Attach the nozzle to the spray bottle. Shake it well to mix all the ingredients. 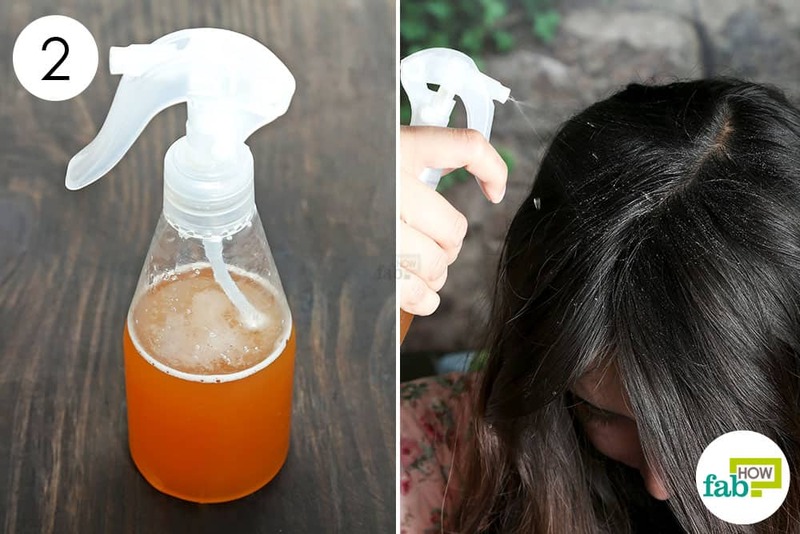 Partition your hair into several sections, and squirt the anti-dandruff spray all over your scalp. Cover your hair with a shower cap, and wait 15 minutes before rinsing it out with cool water. Shampoo your hair with a mild homemade or herbal shampoo. Do this once a week to get positive results in 1 month. Another way to use apple cider vinegar for dandruff is by incorporating it into your daily shampoo along with some crushed aspirin. The salicylic acid found in aspirin helps reduce inflammation of the scalp, and salicylic is an oil-loving ingredient that will break up the sebum in the follicle. This method is suited for people who are always running out of time. Using it in the shampoo does not require you to leave an anti-dandruff solution in your hair for too long. The shampoo will also diminish apple cider vinegar’s pungent smell. Pour 4 tablespoons of a mild shampoo into a container. Add 2 tablespoons of raw apple cider vinegar. Add 3 crushed aspirin tablets. 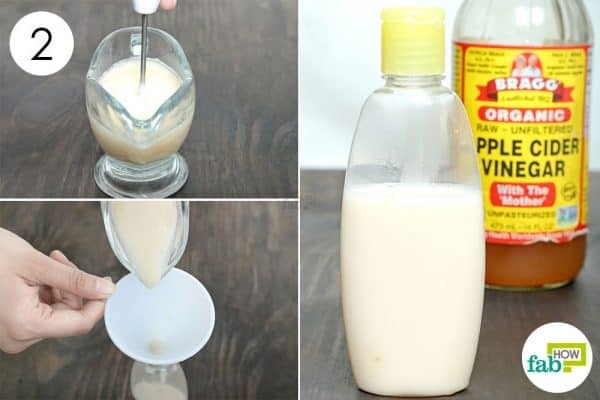 Use a funnel to pour the liquid mixture into a pump bottle. Apply a coin-sized quantity of the shampoo on your scalp. Let it sit for 5 minutes, then massage your scalp and rinse it out with cool water. Follow with a conditioner and allow your hair to air-dry. Use this shampoo once every two weeks to keep dandruff in check. If you don’t want to use commercial shampoo anymore, you can whip up a homemade apple cider vinegar-based anti-dandruff shampoo. Along with apple cider vinegar, this shampoo uses olive oil that helps moisturize your scalp. The fatty acids in the oil immediately control the itching. The aspirin helps reduce inflammation. 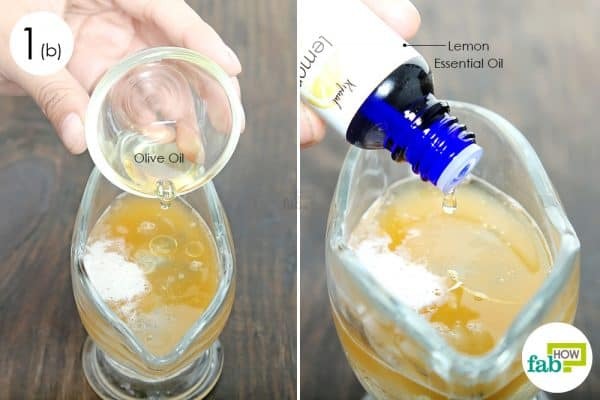 This DIY shampoo also uses lemon essential oil, which is another powerful antimicrobial agent and also imparts a refreshing fragrance to the shampoo. The Castile soap used as the cleansing base helps create the suds and is extremely mild on your scalp. Pour 2 tablespoons of apple cider vinegar in a container. Drop 1 aspirin tablet into it. 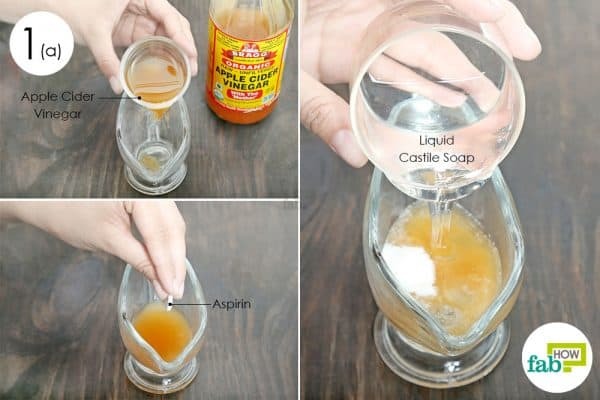 Add 4 tablespoons of liquid Castile soap. Add ¼ teaspoon of olive oil. Finally, add 2 or 3 drops of lemon essential oil. Use a motorized blender to whip up the ingredients. Funnel the prepared shampoo into an empty shampoo bottle. Wet your hair and rub a small amount of the shampoo on your entire scalp. Leave it in for 10 minutes, massage your scalp and rinse it out with water. Let your hair air-dry completely. Use this shampoo once a week to get rid of dandruff in 1 month. 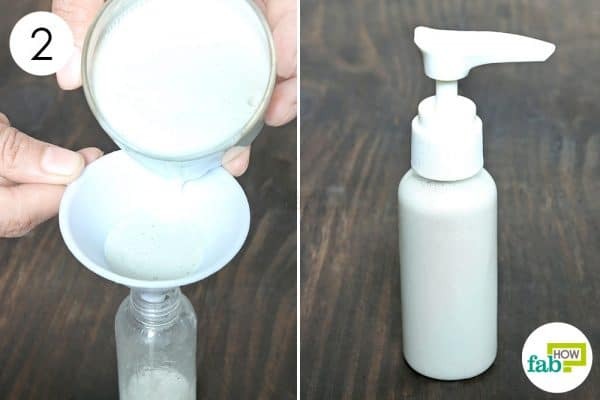 Reuse your old shampoo bottles for storing your homemade products after washing them clean. Apple cider vinegar can also be used as a final rinse after shampooing your hair. For this, you need to dilute it with freshly brewed chamomile tea. Like apple cider vinegar, chamomile tea has antimicrobial properties. It also helps moisturize your scalp and reduces itching and inflammation. Rinsing your hair with this blend will also impart a golden glow to your tresses. Brew a cup of chamomile tea and let it cool to room temperature. 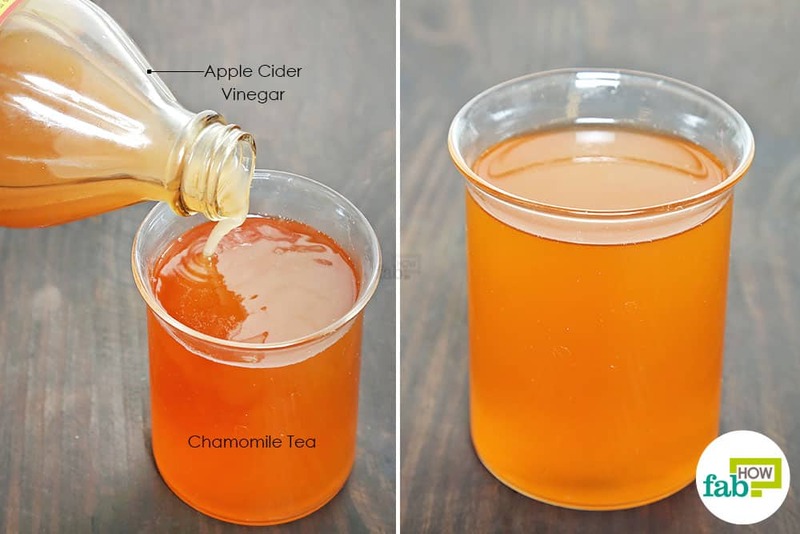 Mix in 1 tablespoon of raw apple cider vinegar. Shampoo and condition your hair like you normally do. Preferably, use a homemade anti-dandruff shampoo. 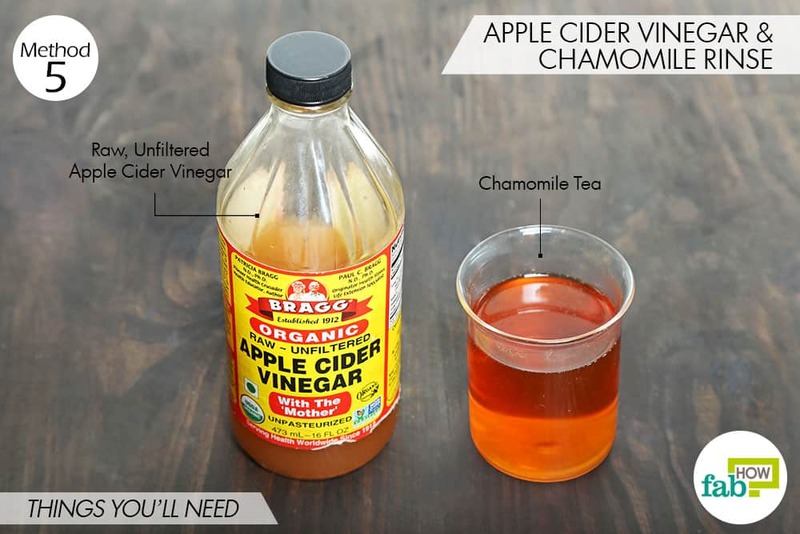 Finish up by pouring the apple cider vinegar & chamomile blend over your hair. Keep your eyes closed while doing this. You need not to rinse your hair again. 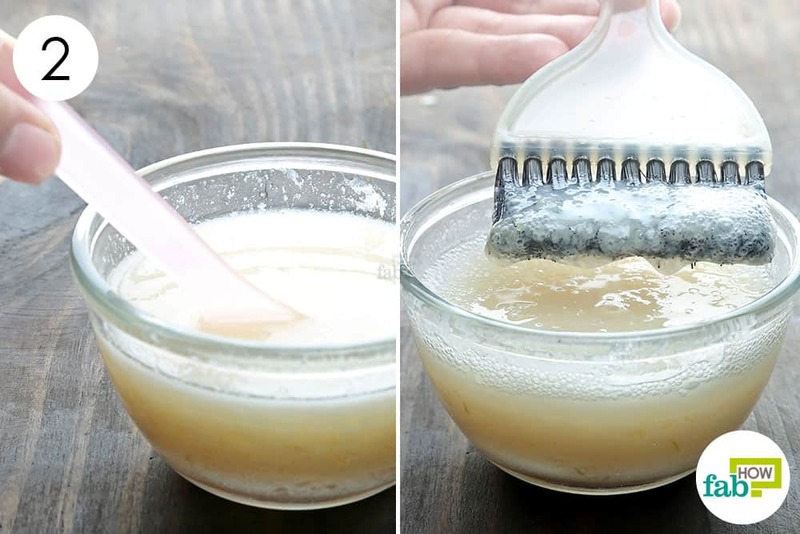 This is another recipe for a hair rinse to get rid of dandruff — this one you use before shampooing your hair. 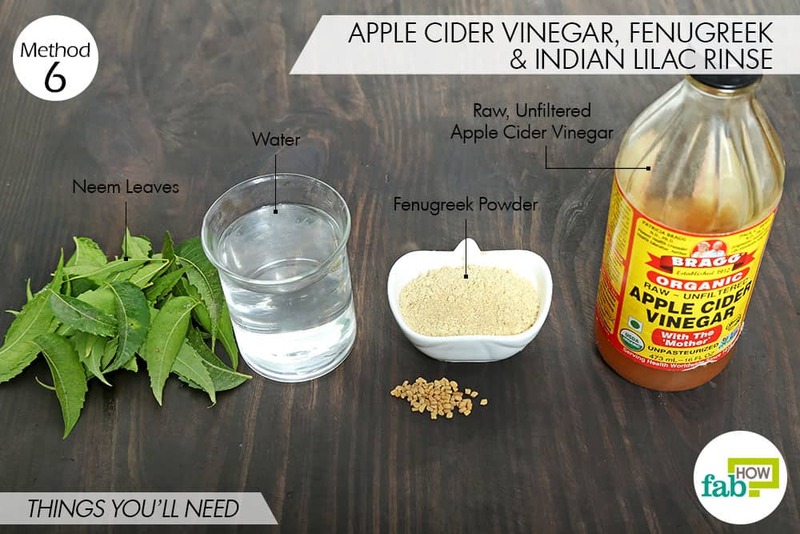 It contains a combination of apple cider vinegar along with fenugreek seeds and Indian lilac (neem) water. The fenugreek seeds contain nutrients that help fight scalp troubles. They also help with premature graying of hair and boosts healthy hair growth. The neem water works as an antimicrobial to kill and stall the growth of microbes that lead to a flaky scalp. 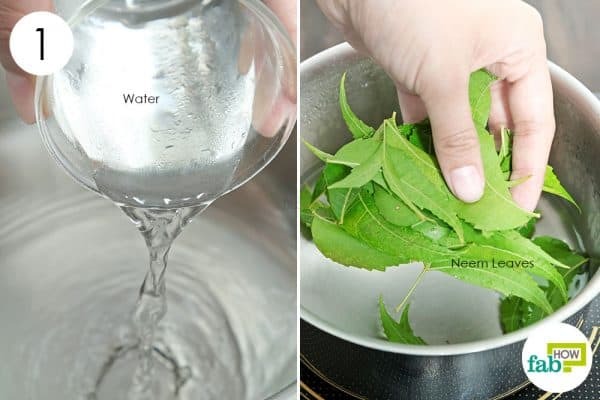 Drop 10 to 12 neem leaves in the water. Bring the water to a boil, then let it simmer for 10 to 15 minutes. Turn off the heat and allow the liquid to cool down completely. Put 3 tablespoons of fenugreek powder in a bowl. Use a spoon to mix the two thoroughly. 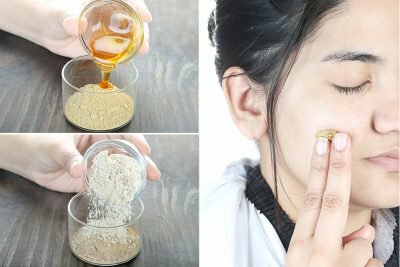 Alternatively, if you do not have fenugreek powder, you can soak fenugreek seeds in water overnight and grind them into a paste. 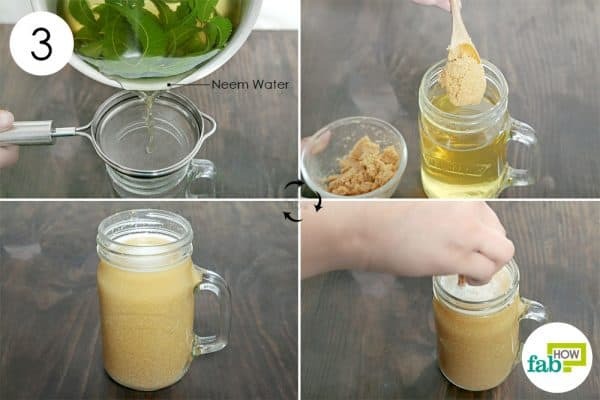 Strain out the neem water into a pitcher. Add the fenugreek-vinegar paste to the neem water. Stir well until it dissolves completely. Wet your hair and pour the liquid over your hair. Massage your scalp and leave it in for 10 minutes. Thoroughly rinse it out with water. Use this once weekly to treat dandruff and to maintain healthy hair. 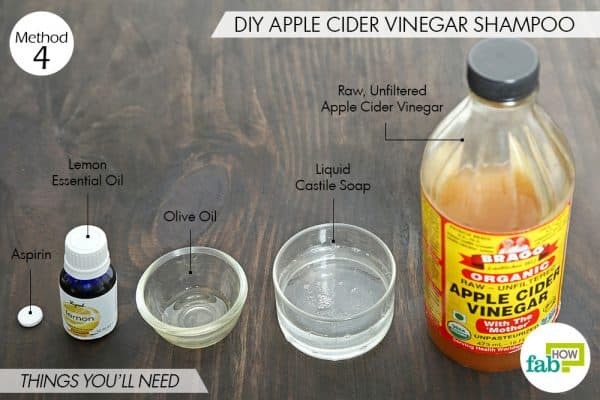 We’ve described how to use apple cider vinegar for dandruff as shampoo and as a hair rinse, which brings us to the option of using it as a hair conditioner. Conditioning your hair helps lock in the moisture and prevent or treat a dry scalp. 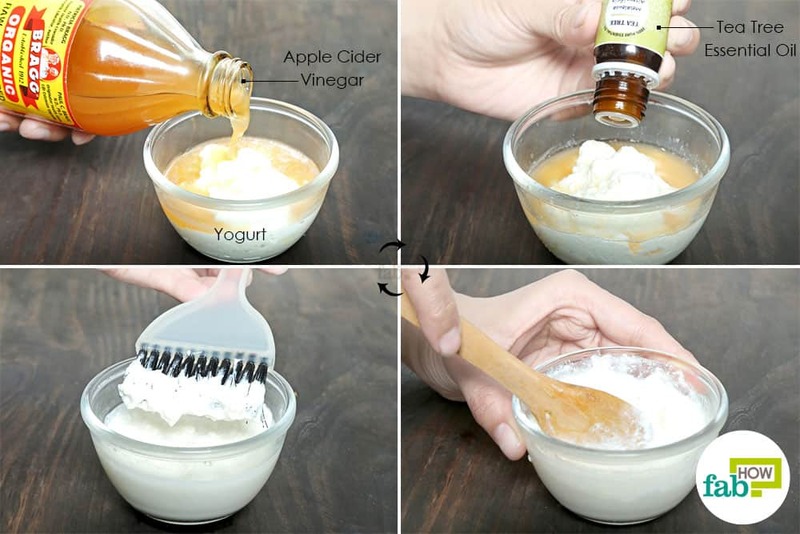 To make your conditioner for curbing dandruff, you need to combine apple cider vinegar with plain yogurt and tea tree oil. While the vinegar works as an antimicrobial agent, the vitamins and proteins in the yogurt will nourish your scalp and hair. The tea tree oil is a strong antibacterial and antifungal oil that further helps fight scalp infections. Mix ¼ cup of yogurt, 1½ teaspoons of apple cider vinegar and 2 or 3 drops of tea tree essential oil. Shampoo your hair with a mild hair cleanser and wring out the excess water from your hair. Separate your hair into several sections and use a hair dye brush to apply the blend to your hair and scalp. Massage your scalp and leave the anti-dandruff conditioner in for 15 to 20 minutes. Thoroughly rinse it out with cool water, then let your hair air-dry. Use this conditioner once weekly and say goodbye to dandruff and other scalp troubles. 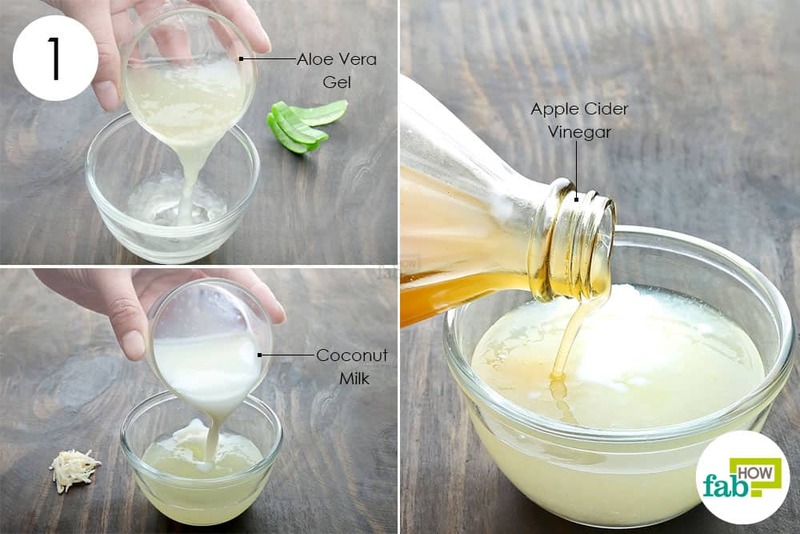 Lastly, apple cider vinegar can be whipped up into a hair mask along with aloe vera gel and coconut milk. While the vinegar takes care of the infection causing dandruff, the aloe vera gel helps unclog the hair follicles and soothe the inflammation with its cooling properties. The coconut milk moisturizes the scalp and nourishes your hair from the roots to the tips. Pour 3 tablespoons of fresh aloe vera gel in a bowl. Add 2½ tablespoons of coconut milk. You can also make coconut milk at home. 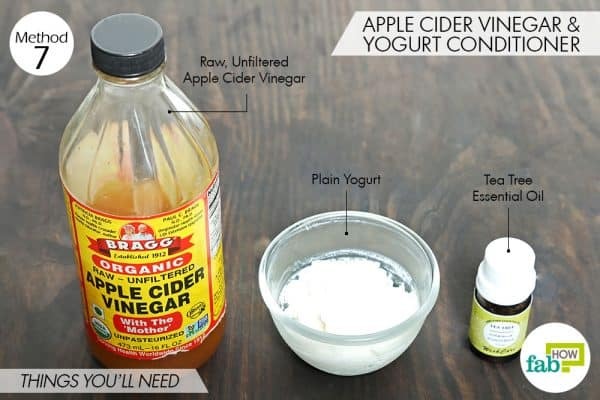 Add ½ tablespoon of raw apple cider vinegar. Use a spoon to blend the ingredients. Dampen your hair and use a hair dye brush to apply the blend all over your scalp and hair. Massage your scalp for 1 minute, then let the mask sit for 5 to 10 minutes. Rinse it out thoroughly with plain water and let your hair air-dry. Use this mask at least twice every week to treat your dandruff effectively and keep your hair smooth and shiny. Never tie up your hair while it is still damp. The moist environment becomes a breeding ground for bacteria and fungi and can lead to dandruff. A blend of lemon with yogurt can also be applied as a hair mask to treat dandruff. Avoid washing your hair too often, as it can strip your hair of its natural oils and lead to a dry scalp and dandruff. For thin hair, wash it not more than twice a week and for curly hair once a week is enough.